The singleton design pattern is one of the creational patterns. “The Singleton Design Pattern will ensure that there is only one instance of a class”. The term came from the mathematical concept of a singleton. In mathematics, a singleton, also known as a unit set, is a set with exactly one element. 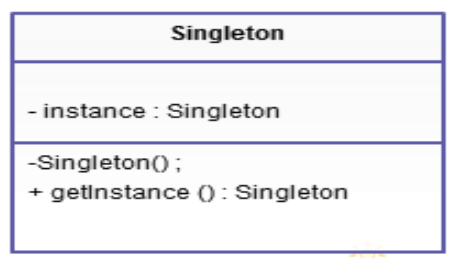 The class diagram of the Singleton is given below. Static Member – This contains the instance of the singleton class. Private Constructor – This will prevent anybody else to instantiate the Singleton class. Static Public Method – This provides the global point of access to the Singleton object and returns the instance to the client calling class. Now, we will see the implementation of the singleton design pattern. The example implementation is going to use lazy initialization. The explanation is given below. We will test the above code with the client code. The output of the code is given below. The output is telling there is only one object has been created when we call getSingletonInstance() method the first time. For the subsequent calls, the created object reference has been returned. We will test the same SingletonLazyInitialization class with the multi-threaded environment. The thread class code is given below. We will launch multiple threads to test the SingletonLazyInitialization class. The client code is provided below. The output of the above code is given below. From the output, we can observe that the constructor called twice and two instances have been created. 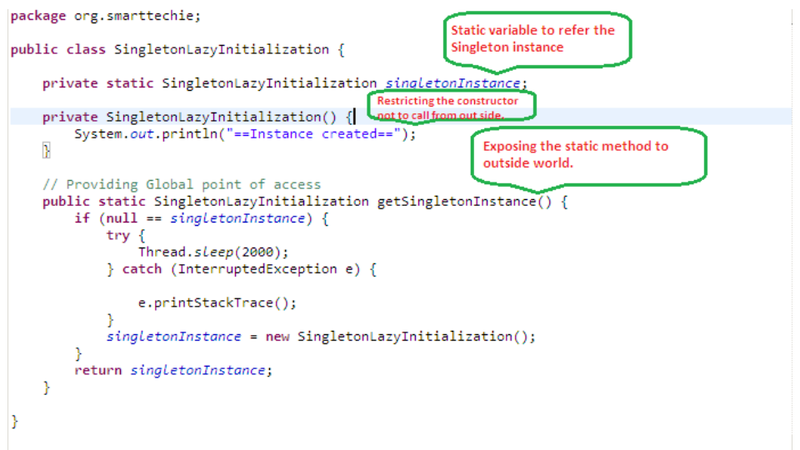 So, in a multi-threaded environment, the SingletonLazyInitialization won’t work. The advantages of the above implementation are “Faster, because of lazy initialization. Works well in the single-threaded environment”. The disadvantages of the above implementation are “It will give abrupt behavior in a multi-threaded environment. Possibly create multiple instances”. 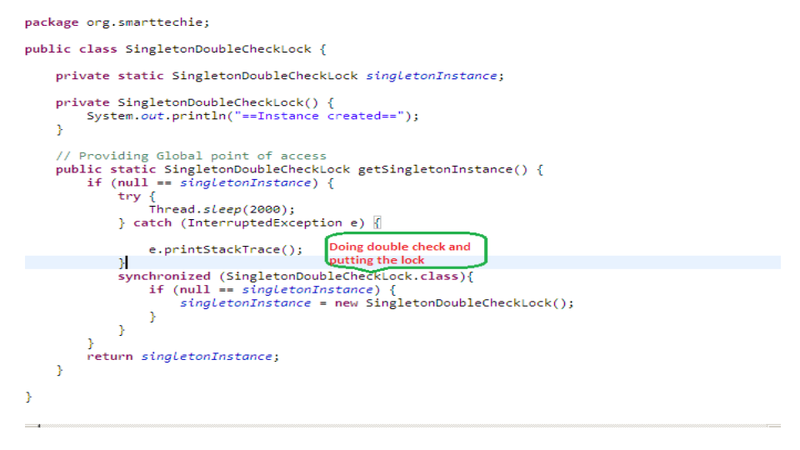 The singleton with lazy initialization will not assure that there is only one instance in the multi-threaded environment. To make singleton to work in a multi-threaded environment, we need to use some lock so that the subsequent threads won’t get into “getSingletonInstance()” method. The implementation is given below. We will test the above implementation in a multi-threaded environment. The client code is given below. From the above output, we can conclude that double check lock ensures that, at any point, the only a single instance will get created. This is the third way of implementing a singleton. The code is given below. In the above code, the static variable gets initialized during the class loading. The instance is created before accessing by threads. That ensures that, in a multi-threaded environment, there is only a single instance is available. The example code used in this article is available here.